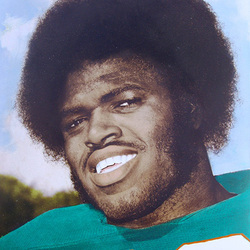 At he University of Miami where All-American defensive lineman are almost os common as classrooms, Eddie Edwards is still remembered as one of the Hurricanes' very best. At 6-4 ans 248 pounds the native from Fort Pierce, Fl. Edwards terrorized opposing quarterbacks and running backs for all three of his seasons as a Hurricane. He recorded over fifty tackles per season in each of his first two seasons, and averaged better than 13 stops and two quarterback sacks per game in his senior season. In 1976 coach Carl Selmer described Eddie Edwards as " the best defensive football player in the country. Coach Hal Allen added, "Eddie just had it all, great size, speed, quickness and a hard working attitide that you rarely see in a player of his pure natural ability". Edwards capped his Hurricane career by being named to every major All-American team in the country.